About 200 more seats will be added to the first floor, as well as a few new vendors. The wellness centre will be expanded and moved to the basement. Tufts says the consultation process has also highlighted the need for basins, to allow people to wash before they pray. A new entrance with a naturally lit atrium will be added on the LeMarchant Street side of the building, where the amphitheatre lies unused. Tufts says that this space may be a concert venue at night, and space to relax during the day. A second entrance will also allow different parts of the building to have different hours, potentially enabling 24-hour access to some rooms. The roof of the new atrium will feature a rooftop garden, similar to the Seaport Market’s. DSU president Sagar Jha says that he would like a hot tub to make an appearance. “That’s a very serious possibility,” says Jha, laughing. 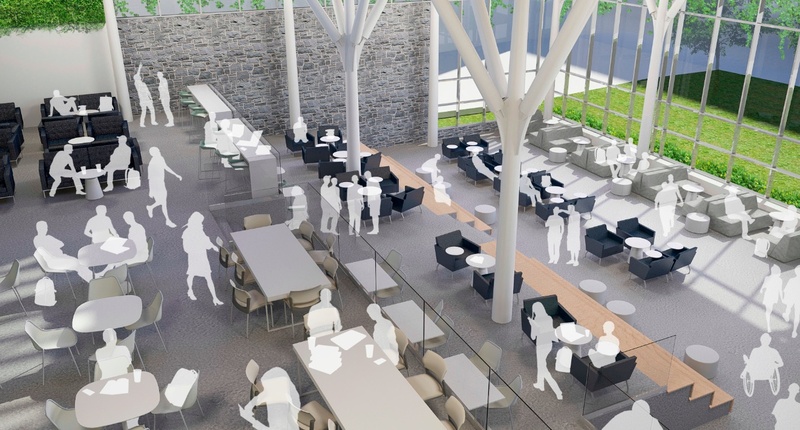 The atrium will also have its temperature naturally regulated by using vegetation to block excess light in the summer. In the winter, the vines will whither, allowing more light to enter the space. The DSU will not be aiming to achieve a sustainable certification for the new building, says Tufts, citing the increased costs of the certification process. However, Tufts says the expansion will cause the building to use less water, and no more power than it currently does. Read our comprehensive examination of what the new SUB has in store here. Calum was a News Editor of the Gazette for Volume 146 and served as Assistant News Editor for Volume 145.